Home BassEFX and Darkglass Electronics Microtubes B3K Give Away – Oh My! BassEFX and Darkglass Electronics Microtubes B3K Give Away – Oh My! Every pedal I’ve given away has been special or unique and have been built with quality. I know that every pedal given away found a happy home on a player’s board ripping faces off around the world. Today, is very special… because I have an opportunity to give away something that people have been going nuts for. Almost at a daily level, I hear about this pedal. More importantly, I hear about the hype… but how it meets it’s level of expectations – and delivers. Today, I’m very proud to announce the Darkglass Electronics Microtube B3K Give Away! Bass players have been going crazy about this pedal – simply stating that this could be the greatest distortion pedal for bass out there. Boom! 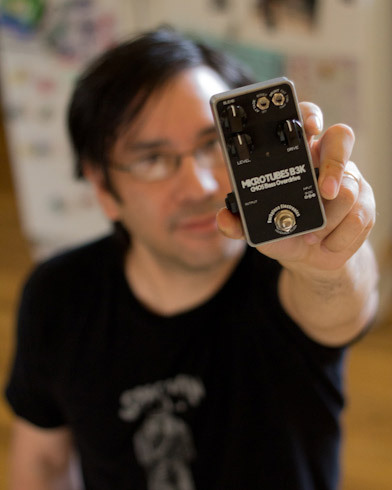 Chad Beeler of BassEFX contacted me to see if I would be interested in giving this pedal away, and I jumped all over the chance. Thank you Chad! BassEFX is an official dealer of Darkglass Electronics located in Finland. Be sure to visit BassEFX to see what other products they offer. They specialize in bass oriented effects and have excellent customer service/support and can help with recommendations from a bass players point of view. Also, follow BassEFX on Twitter and Facebook. They often put up deals and news. Definitely great to follow! In the recent years, pedals for bass players have gained popularity, and I love the trend and hope it continues, and want to promote pedals for bass when I can here on EffectsBay! I also wanted to thank Darkglass Electronics as well for creating this beast of a pedal. Please follow them on Facebook and Twitter to learn more about their products. I recently posted a guest review by Chad on the Darkglass Electronics Microtube B3K and is definitely worth a few moments to read – lots of detail about the company and about this particular pedal! I’m going to select one random entry on October 11th. I will email that random entry asking for the answer to the question listed below. They will have 24 hours to respond with the answer. If the 24 hours passes and I don’t hear from that finalist, I will select a new random entry and repeat the process until I receive confirmation from the winner. This is open to everyone. Yes, that means international! Also, one entry per person. Please read that last sentence again… “one” “entry” “per” “person”. The submission form will be open until October 11th (Thursday) 12PM MST. On top of that, BassEFX is going to sweeten the deal even further. If you ‘LIKE’ BassEFX on Facebook and you’re selected as the winner, they’ll throw in an extra prize – a free Bass EFX T-shirt! So, it’s pretty much a no-brainer to like Effectsbay and BassEFX on Facebook! Just click the ‘likes’ below. Please help promote this give away by Re-Tweeting and sharing on Facebook! Keeping these give aways successful is the key to more give aways. Everyone likes free stuff right? JHS Panther Cub Delay Give Away! Jack Bruce often covered rhythm guitar parts for Clapton in Cream.